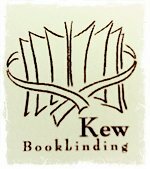 After a total of 14 years of successful trading, Kew Bookbinding in Thame is selling up and is now open to offers. We have been featured on the BBC's Escape to the Country, on BBC Radio and in the local press several times and have, over the years, bound some very prestigious works. We have customers who have been with Malcolm Kew, who trained at the British Library, for over 30 years. or email malcolmkew@mac.com directly for a sales brochure. We are always interested in hearing from experienced bookbinders who might have something to contribute to our team. We are a local bindery specialising in hand crafted photo books. We are looking for an apprentice to join us. We are based in Wokingham which is near Reading in Berkshire. We are quite desperate for a binder or a trainee book binder to help our head binder, especially for our Christmas rush. - Enthusiasm for making beautiful books and attention to detail are the key skills for this position. - Assistance with finding accommodation given. - Full time position available immediately. - Preparation work necessary for conservation of books and manuscripts prior to binding, including pulling, cleaning, conservation, pressing, collating and sewing. - Ability to produce all styles of binding; rebacks, rebinds, library style, account books. Quarter, half and full bindings in leather and buckram. - Hand gold finishing in gold leaf/foil, both in type and hand letters. - Previously worked within a hand bookbinding environment. - An excellent understanding of all aspects of handbinding and gold finishing. - Good eye for detail. Come and teach at the LCBA! The centre is looking to add more workshops to their schedule. If you have an idea for a workshop to teach at the Centre, please let them know by filling in the form on their web site. This is a service we are pleased to provide free-of-charge.